When it comes to forward thinking, green is the new black. At Marco, we're all about going green. Because it's not just better for the environment, it's better for our bottom line. So, we've adopted a host of energy-efficient technologies and environmentally smart policies that help lead our employees, customers and communities to a more sustainable future. We started recycling cardboard in 1987 and from there our recycling program just kept expanding. Today you'll find recycling bins throughout our building for easy disposal of paper, plastic and cans. We also recycle computers and the metal from outdated copy machines. In addition to recycling our own copier/printer toner cartridges, we invite our customers to participate in our vendor recycling programs as well. Customers can send their used toner cartridges directly to our vendors or to Marco for recycling. Our heating and air conditioning systems include programmable thermostats that help us reduce energy on nights and weekends. And our corporate office is home to an energy-efficient Mitsubishi HVAC system. We use an energy-efficient Lutron lighting system throughout our corporate headquarters. We're proud to partner with other vendors and manufacturers — such as, Konica Minolta, Canon, HP and Mitel — who incorporate green initiatives into their business plans. To reduce gas consumption, we've converted the majority of our 265 delivery and service vehicles to fuel-efficient minivans and cars and diesel sprinters and trucks. We scan and digitally store our documents to reduce paper and save on storage space. 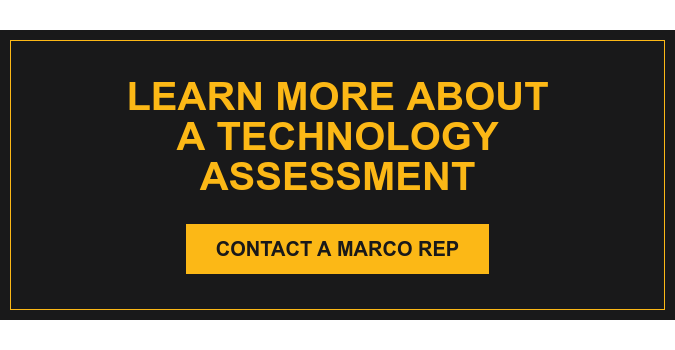 Marco partners with a cleaning service that uses only non-toxic cleaning products. Because servers take up space and use a sizable amount of power, we've virtualized our servers and reduced the number by 80% to save on natural resources and reduce energy costs.